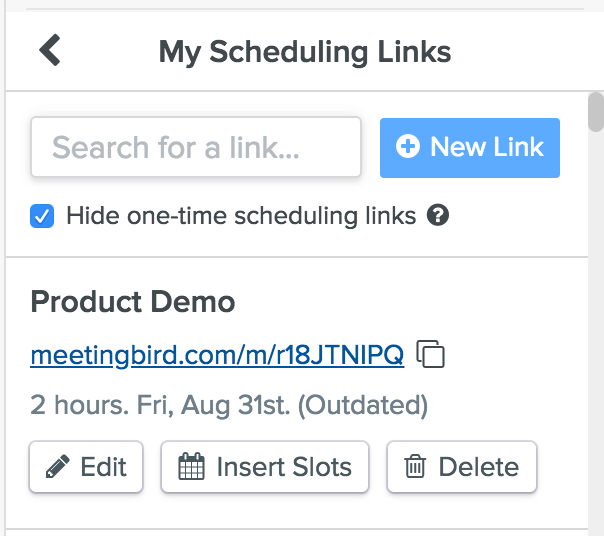 One-time scheduling links are created when you use Meetingbird to schedule a one-off meeting. For example, when you insert potential meeting times into an email reply with the Meetingbird integration for Gmail or Front, a one-time scheduling link is created to manage your settings for that meeting. Since that scheduling link is only being used for a single meeting and typically won't be re-used in the future, it will be hidden by default when you view a list of your scheduling links. Hiding one-time scheduling links gives you faster access to the scheduling links you re-use frequently and prevents your list of links from becoming cluttered. If you ever need to view your one-time scheduling links, simply uncheck the box next to "Hide one-time scheduling links".